The famous golf and holiday resort Quinta do Lago is one of the most exclusive destinations of its kind not only in Portugal, but also in Europe. It is located on the western border of the nature reserve Ria Formosa between Almancil and Faro International Airport. It is a seven km drive from the EN125 in Almancil to the club house in the heart of the resort, and around ten kms from exit 13 of the A22 motorway. In 1974 the first golf course with 27holes designed by William Mitchell was inaugurated. He introduced greens, bunkers and tees in line with American standards to the Algarve. In 1989 nine holes were added by Joseph Lee and Rocky Roquemore, forming the two courses North and South. The South Course is set amongst umbrella pines, lakes and wild flowers, overlooking the spectacular scenery of the Ria Formosa Nature Reserve. Its championship status should not deter the amateur golfer. Whilst the 8th, 15th, and 18th are indeed testing holes for low handicap players, the course provides interesting challenges for golfers of all levels and abilities. Accurate tee shots are essential in order to reach many of the greens and achieve a par and the course is made more challenging by a good variety of doglegs and strategically placed hazards. 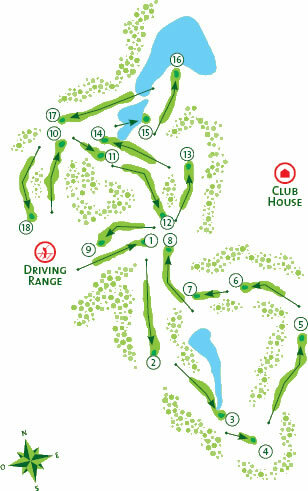 The front nine holes, which wind their way through parkland, favour a draw, while the back nine, which loop around the lake, favour a fade from the tee. The elegant club house, shared by players of both the North and the South courses, is situated in the heart of Quinta do Lago. The terrace offers great views to the 1st and 10th holes of the South Course and a buggy-bar provides refreshments and snacks all day on the courses. The practice facilities, open to the public, are located on the opposite side of the Av. André Jordan, the main thoroughfare of the resort. They are home to the Paul McGinley Golf Academy and include a 500 square-meters 9-hole putting green and a 300-meter driving range with grass and mat tee areas with 6 target greens. Three short game areas are divided into bunker, chipping and pitching sections and are designed to give the player a comprehensive and challenging training session. Quinta do Lago has three championship golf courses, South Course, North Course and Laranjal. Each has been expertly designed to complement its natural surroundings and each offers its own set of unique challenges. The South Course has already hosted the Portuguese Open eight times between 1976 and 2001.